Last major update issued on August 15, 2014 at 04:35 UTC. 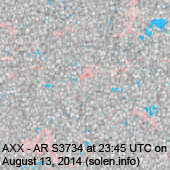 No updates posted on August 16-17, the next update will be late on August 18. 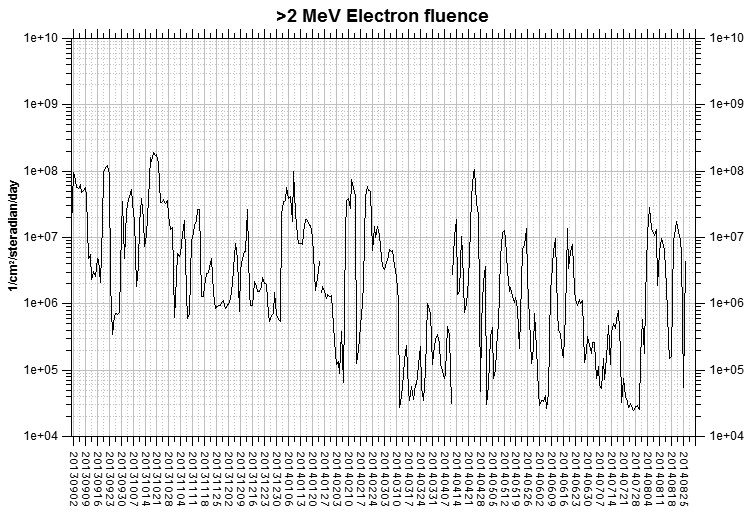 Missing data will be added this week. 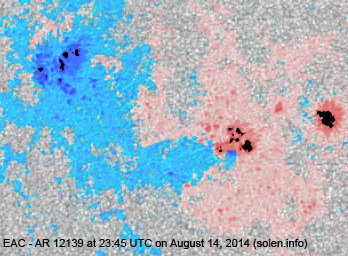 The geomagnetic field was quiet on August 14. 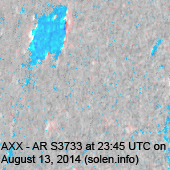 Solar wind speed at SOHO ranged between 334 and 373 km/s. 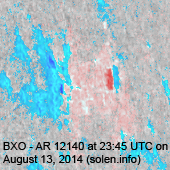 Solar flux at 20h UTC on 2.8 GHz was 103 (increasing 14.5 over the last solar rotation). 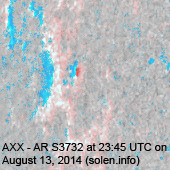 The 90 day 10.7 flux at 1 AU was 130.5. 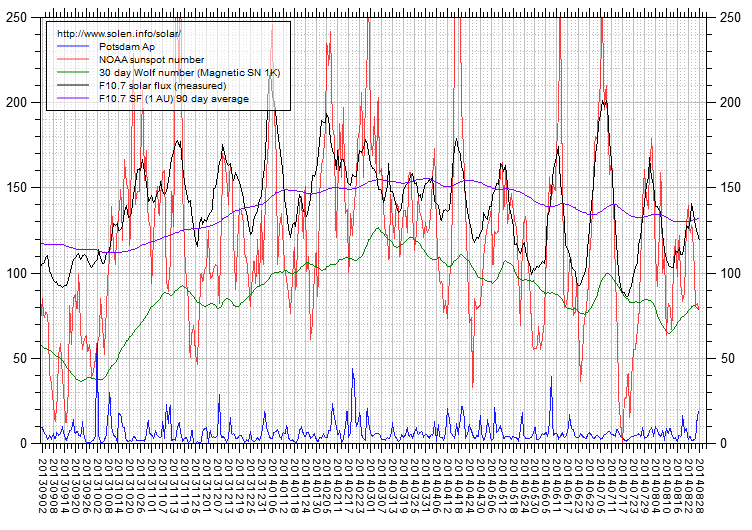 The Potsdam WDC planetary A index was 3 (STAR Ap - based on the mean of three hour interval ap indices: 3.1). 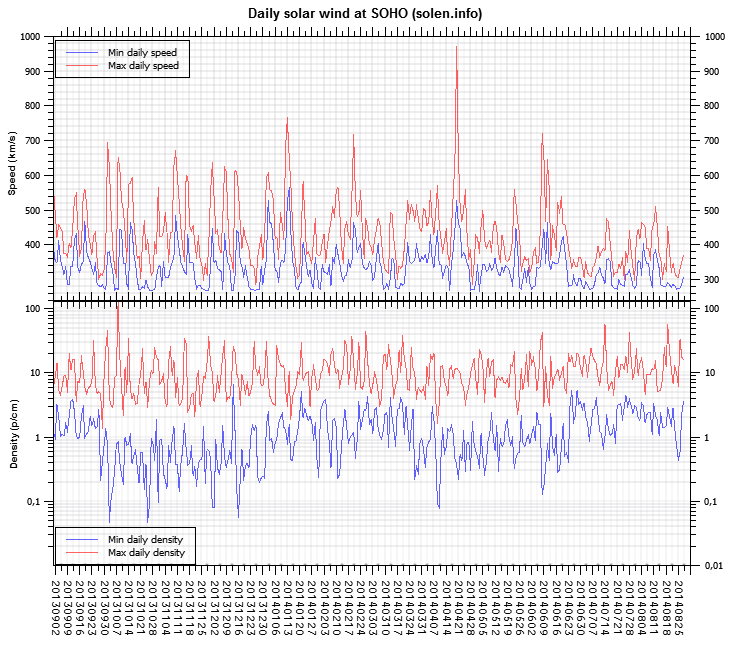 Three hour interval K indices: 11010012 (planetary), 01112412 (Boulder). 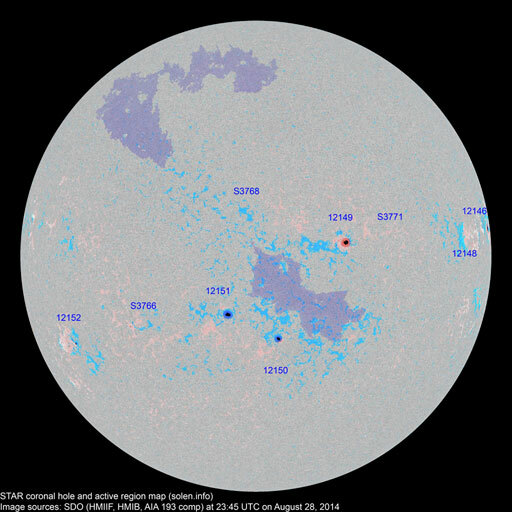 At the time of counting spots (see image time), spots were observed in 9 active regions using 2K resolution (SN: 173) and 7 active regions using 1K resolution (SN: 109) SDO images on the visible solar disk. 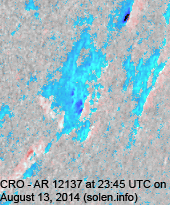 Region 12135 [N15W22] decayed slowly and quietly. 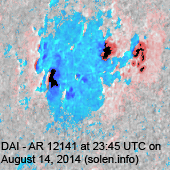 Region 12139 [N14E31] was quiet and stable. 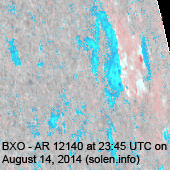 Region 12140 [N13W80] decayed slowly and quietly. 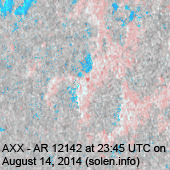 New region 12141 [N17E62] rotated into view on August 13 and was numbered the next day by SWPC as the region developed quickly. 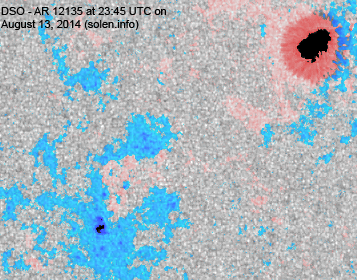 C and minor M class flares are possible. 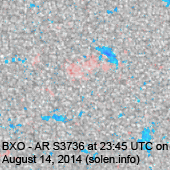 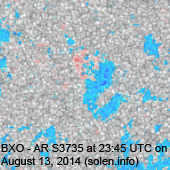 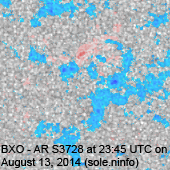 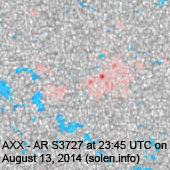 New region 12142 [N07E58] rotated into view on August 13 and was numbered by SWPC the next day. 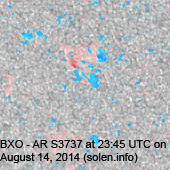 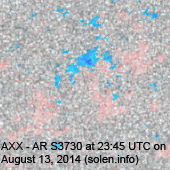 New region 12143 [S07E62] rotated into view on August 13 with SWPC numbering the region the next day. 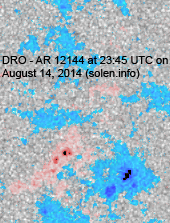 New region 12144 [S18W18] was first observed with spots on August 11 and developed slowly on August 14 when the region was numbered by SWPC. 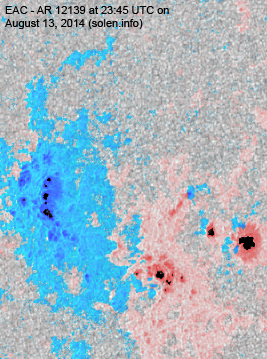 New region S3736 [S20E16] emerged with penumbra spots. 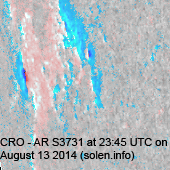 New region S3737 [S28E29] emerged with penumbra spots. 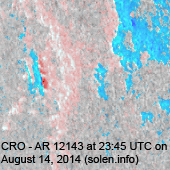 August 12-14: No obviously Earth directed CMEs were observed in LASCO and STEREO imagery. 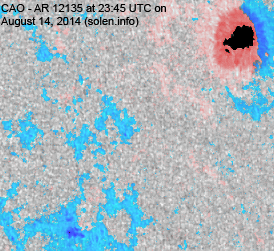 The geomagnetic field is expected to be quiet on August 15-18.